← Yeah so I graduated, now what? I almost forgot it was Thursday. I guess that’s what happens when your weekdays and weekends are the same. Let me just say that the Glee 3D movie was GREAT! I immediately came home and bought the soundtrack from itunes. Which was surprisingly my first glee cd purchase, crazyyyyyy! If you like Glee you should go check out the movie. The 3D didn’t give me a headache, which was nice since the last 3D movie I saw gave me a migraine. Now on to Things I Love to Hate Thursday, yes I changed the title a lil bit today, because while I love the Nike Training Center, I also hate it. I had used the app on my iphone once before. It offers a lot of different workouts based on what you’re looking to do. 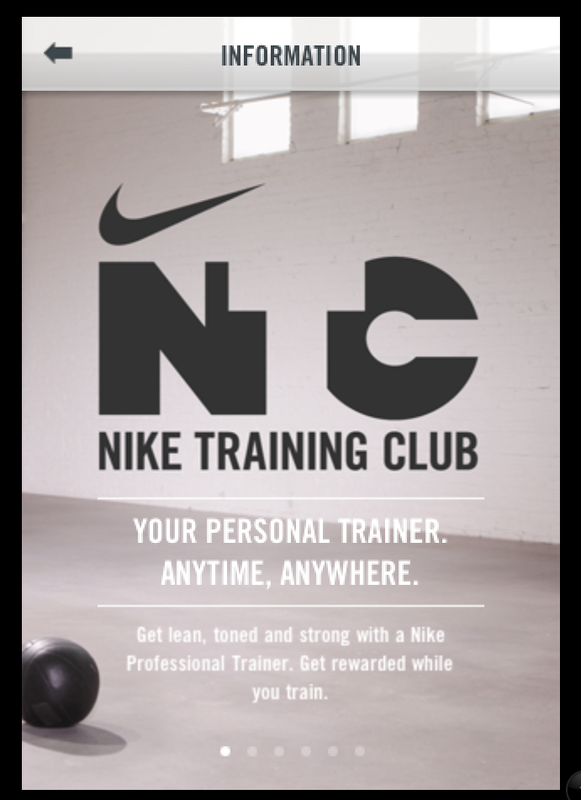 Now that I have my iPad I decided its time to bring back the nike training app. It’s really great because I can workout in my apartment (perfect for a lazy girl) and I need the structure of something tell me what to do. I can’t just come up with workouts on my own. I forget what exercise I’m supposed to do next and I have no creativity. I read a lot of great blogs with tons of workout ideas, but there is one thing those usually lack, a video of the exact exercise! 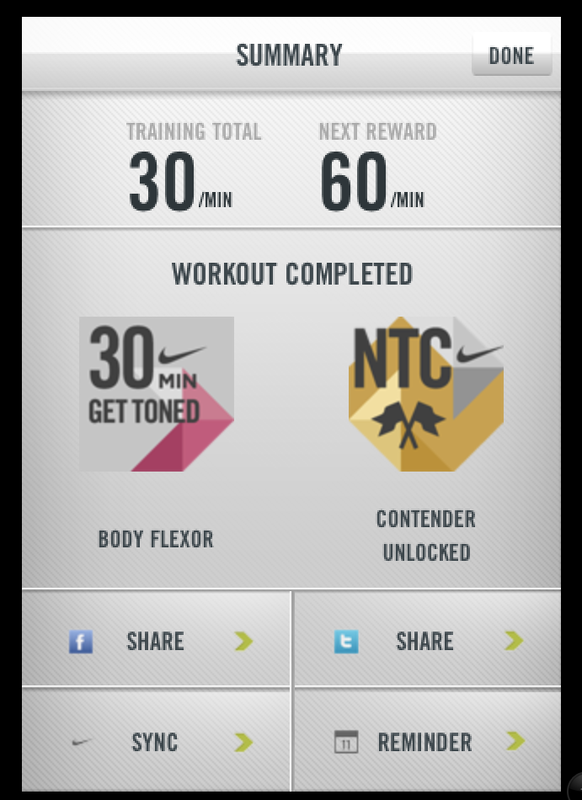 The Nike Training Center app has a video demonstration of each exercise, which is great for an uncoordinated lazy girl. This is the main entry screen. 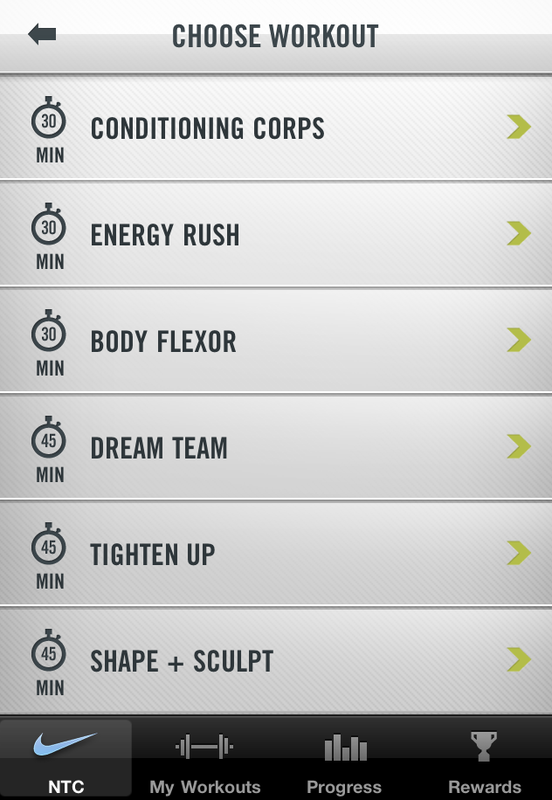 You can either go through and select a workout or use quick start to use a workout you’ve already done. There are four different goals or types of workouts. You can choose to be lean, toned or strong and they have 30 min to 60 min workouts. 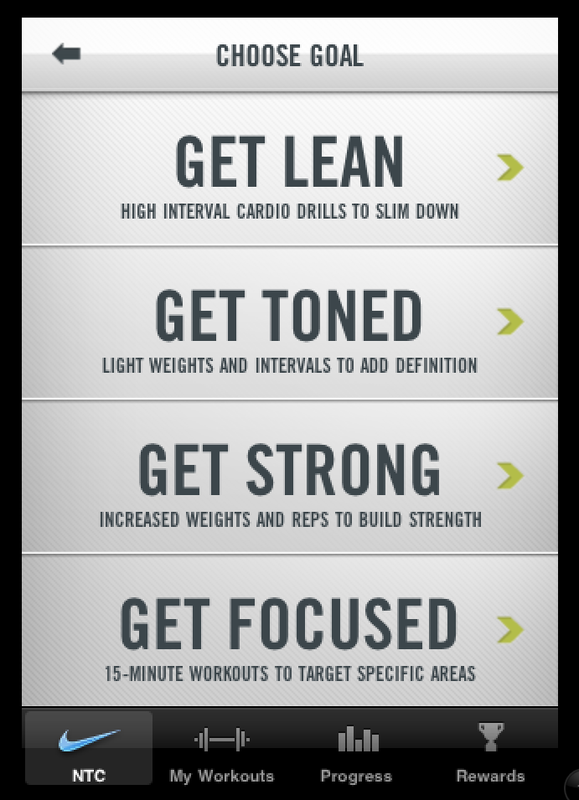 The get focused workouts are 15 min workouts on specific areas that you can pair with doing 30 min of cardio. I use beginner for now (they’re HARD, or at least they are for me). These are the workouts for the beginner section of get toned. I did the body flexor one today. Am I the only person who can’t do walking lunges? I almost fall over every time. I’m so not coordinated considering how athletic I used to be. 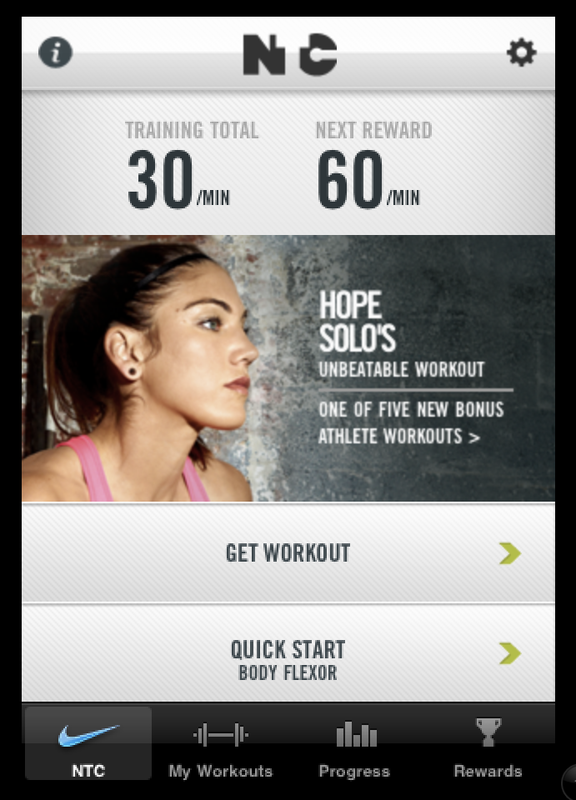 After the workout it gives you the option to share your workouts with facebook or twitter. I’m hurting BIG time now, but I really like these workouts. The video demonstrations are great. Also you can set your playlists to play with the workout. You don’t have to keep track of anything yourself. The app tells you what exercise is next, it keeps track of the time, and it even gives you encouragement. Some of the exercises are in two minute blocks and I would start to get tired with 30 seconds left. Then a lil voice is like you can do it, or keep it up (no I’m not hearing voices in my head, it’s part of the app). 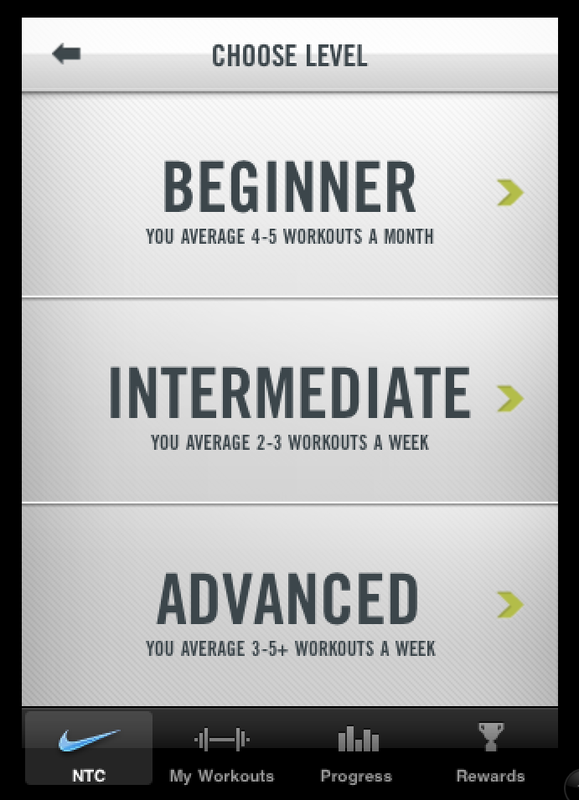 This app is great for anyone who wants a good workout and doesn’t want to pay for a trainer or exercise dvds. This is app is FREE! and easy to use. Right after I started writing this post I saw fitsugar had posted a story about this app too, so be sure to check out their thoughts here.